I’m a sucker for pie crust. But, confession, I’m not actually crazy about pie itself. I just love a good crust. When I make Chicken or Veggie Pot Pie, it’s my favorite part. 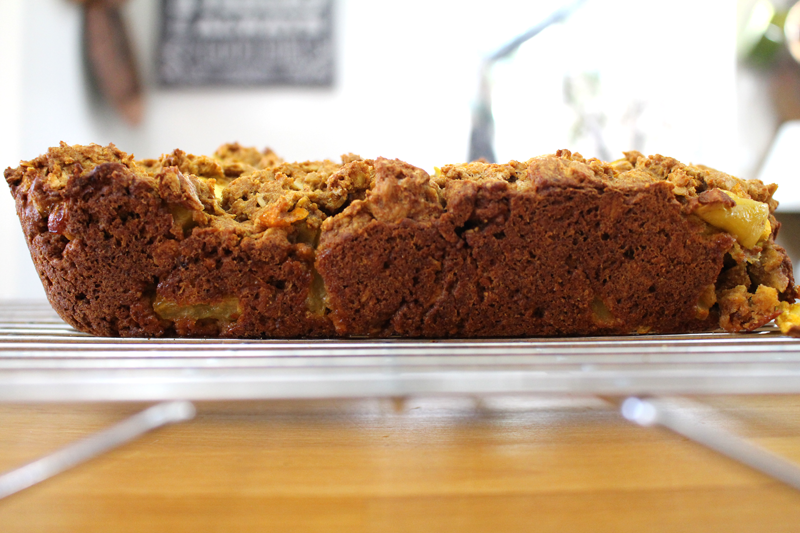 I make it in big batches and keep it in the freezer for days when I’m in the mood to bake. Today, it was time for a tart. I’ve been waiting and waiting for my hachiya persimmons to ripen. Finally, they’re ready. 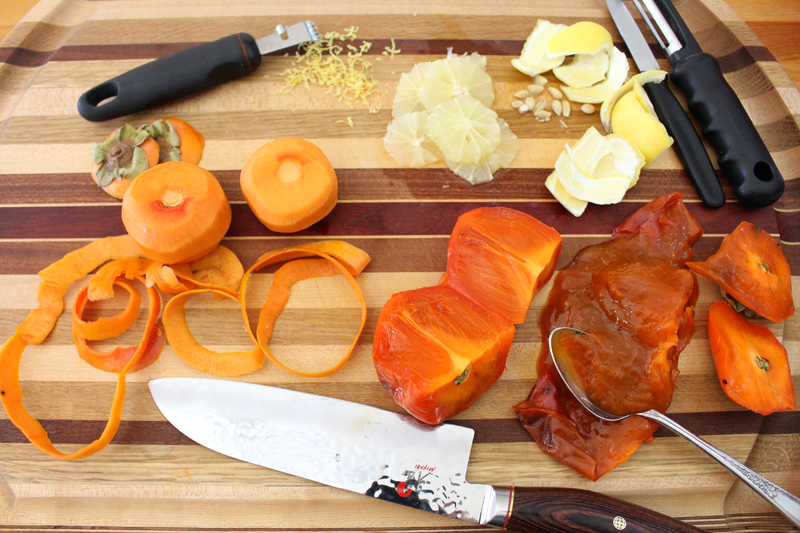 If you’ve ever wondered if you could use a hachiya persimmon before it’s ripe, wonder no more. Just don’t do it. It will make your mouth pucker and get that gross dry feeling that you might not understand if you’ve never experienced it. Trust me, you’re better off heeding my warning. Wait. Until. They’re. Ripe. 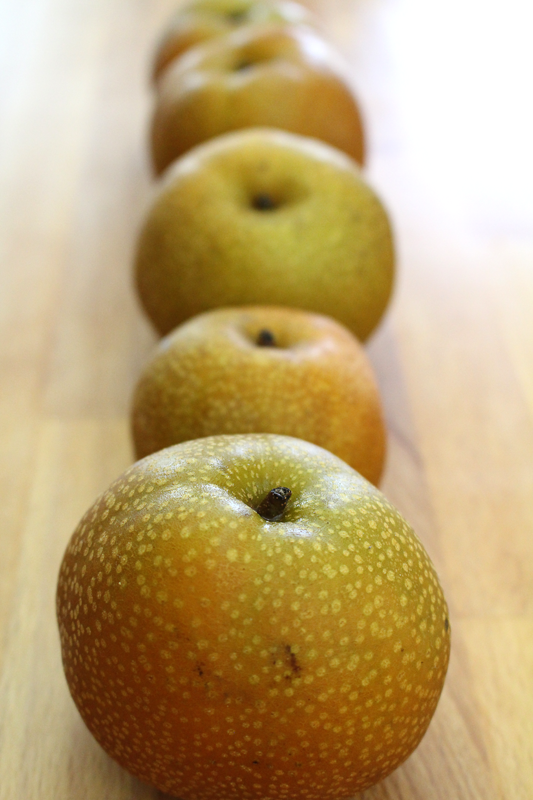 You can hasten the ripening process by placing them next to, or in a paper bag with, apples and bananas, which give off ethylene gas. You can also put them in the freezer. Or, just leave them on the counter for a few weeks like I did. You’ll know they’re ready when they feel like a water balloon and you think your fingers are going to break through the skin without even squeezing. While this recipe makes enough filling for two tarts, I saved half for another recipe. But, maybe you want to make two because this would be the perfect dessert for Thanksgiving dinner (you’re welcome), or for breakfast the next day (double welcome). It would be a great idea to switch out the ingredients depending on what you have on hand. No persimmons? No problem. 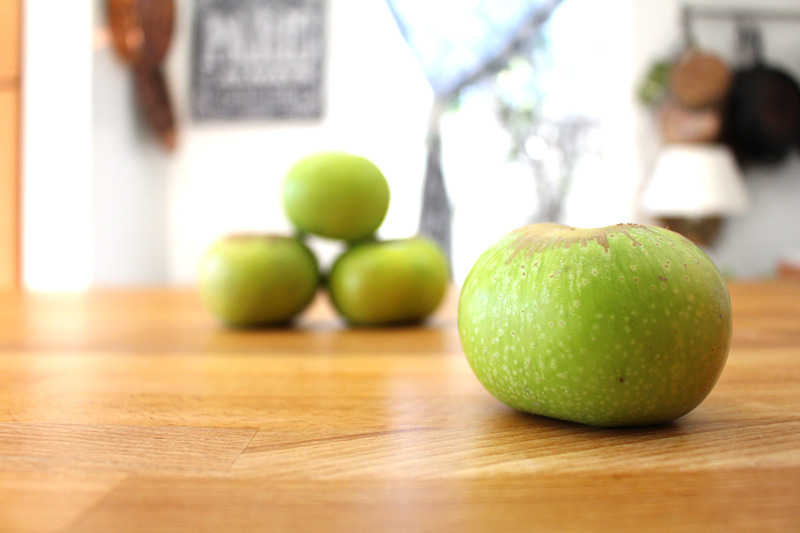 Try apple sauce and apple slices. No lemons (or maybe they’re too tart for your taste)? Use oranges. Want to go vegan? Skip the egg wash or try coconut milk. Oh, and use a butter-free crust. Gluten-free? There are lots of GF options these days, so find one at your local market, or visit the Gluten-Free Girl’s site to find out how to make your own. I like the rustic look of this tart, otherwise known as a galette. You get to see the pretty filling with the edges folded up all around. 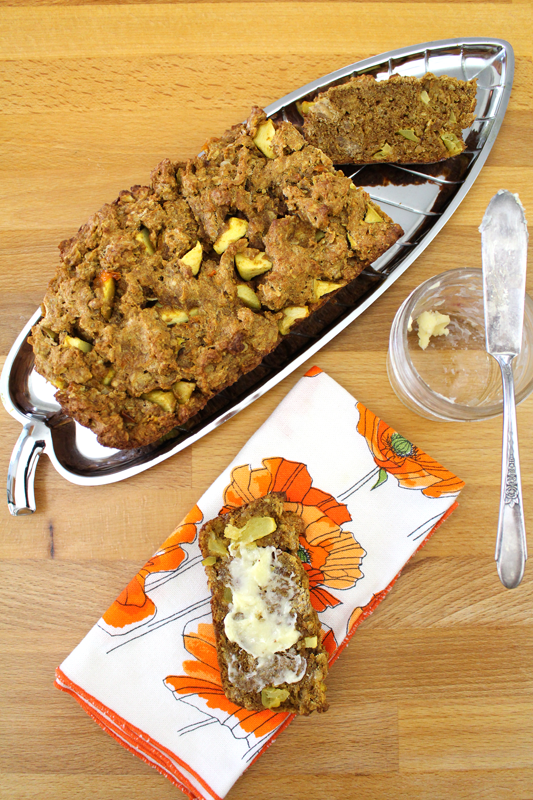 Plus, after it cools (yes, let it cool completely before eating), it’s easy to slice up and eat it out of hand. No plates required. That’s winning to me (because the dishes! always with doing the dishes!). I topped the tart with a dollop of maple syrup sweetened whipped cream and some pomegranate seeds. 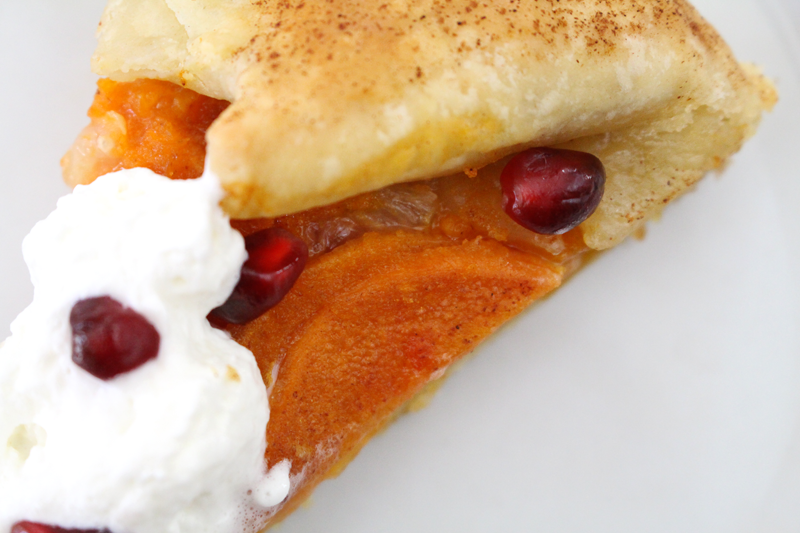 The seeds add a juicy burst of flavor that’s the perfect compliment to the flaky crust, and deep, sweet filling. Combine lemon/orange zest through salt. Taste for sweetness. 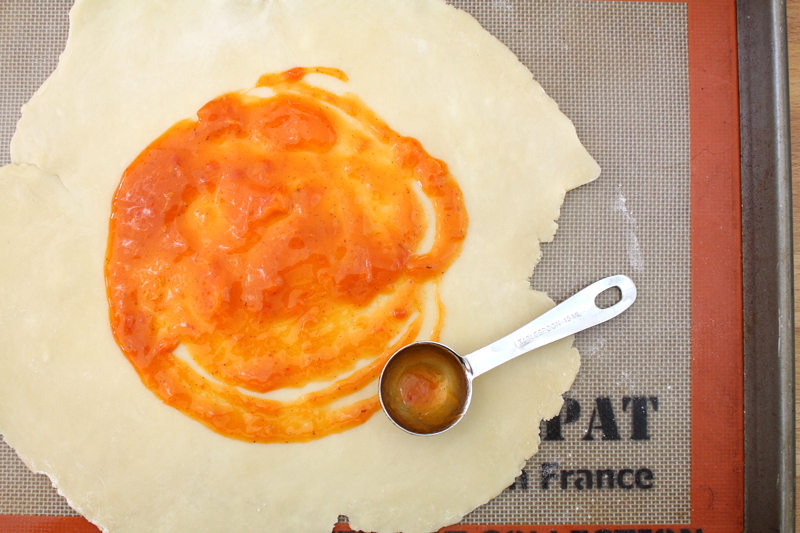 Roll out pie crusts in a circle on a lightly floured surface. Place on a parchment or Silpat lined baking sheet (use one with edges in case the filling runs). Spread about 3 T at a time of the hachiya mixture in the center of each crust. Top with some fuyu slices and lemon/orange chunks. Repeat until all of the hachiya mixture and slices are gone. 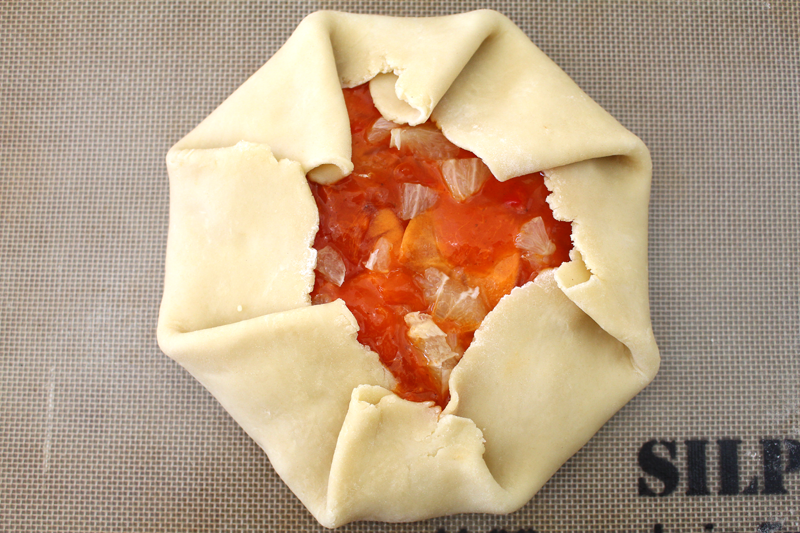 Gently fold the edges of the crust up and around the filling, leaving the center open. Brush crust with egg and sprinkle everything with cinnamon. 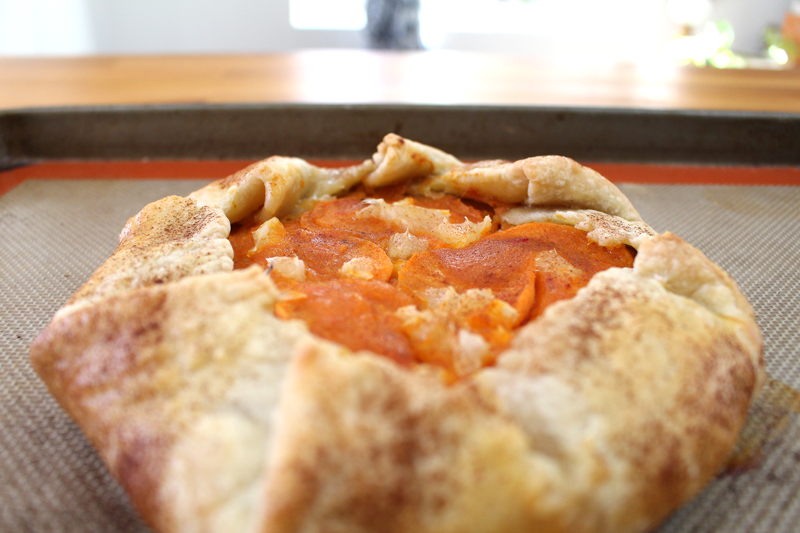 Bake for 25-30 minutes, or until crust is golden and flaky and filling is hot and bubbly. 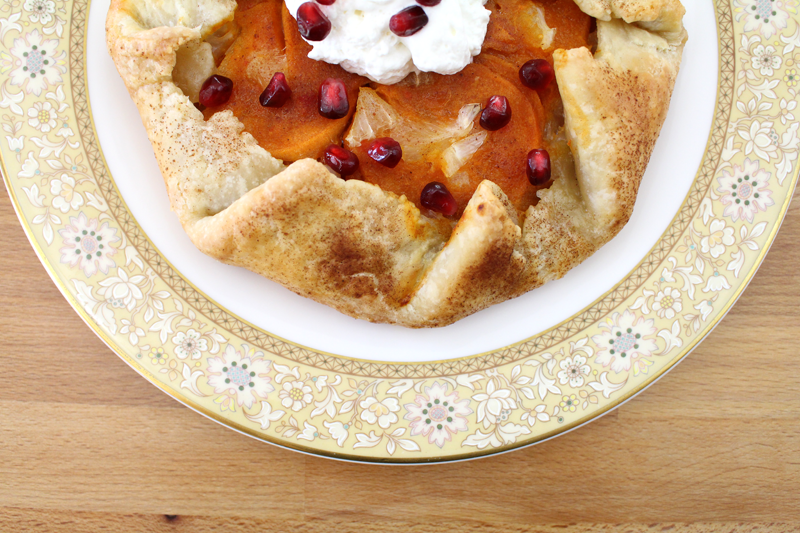 Serve topped with whipped cream and pomegranate seeds. I’ve never been the best baker. I like to think that it’s because of my lack of skill when it comes to all things science. I got a D in chemistry in high school. Sometimes I wonder, if they’d told me how much I would care about science when I grew up, or if someone had shown me science in action, in the form of different baked goods, if it would have clicked. Maybe not, but I wonder. So I’m slowly learning about baking. I’m a kinesthetic learner – I learn by doing, so it’s taking some trial and error to figure things out. What comes the most naturally to me when cooking is figuring things out as I go; recipes used for inspiration more than direction. That doesn’t really work with baking. But, I guess I’m learning, because these muffins did. It helps that I know what the batter should look and feel like. The more I bake the more I know about doughs and batters and the like. 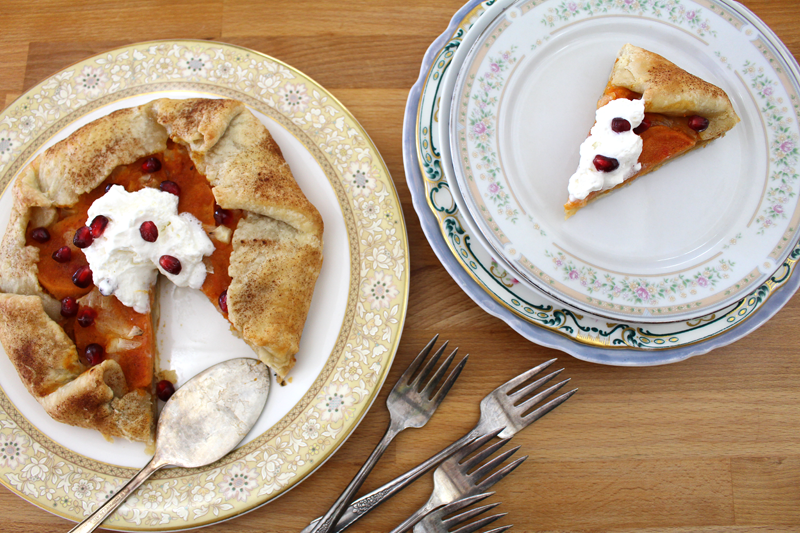 The stars of this recipe are Asian pears and figs, but any seasonal fruit will do: apples, berries, cherries, persimmons… Use what you love and what you have on hand. There are also carrots, but you could use parsnips or summer squash in their place. 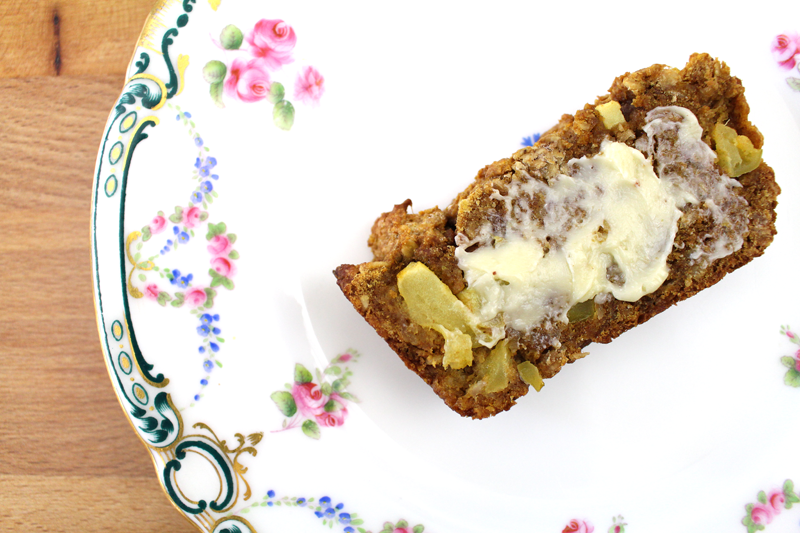 I used whole wheat flour and butter. But, of course, adapt it to suit your family’s needs. You could try a gluten-free flour blend if you’d like, or to make it vegan, use cold coconut oil and substitute flax seeds and water for the egg. 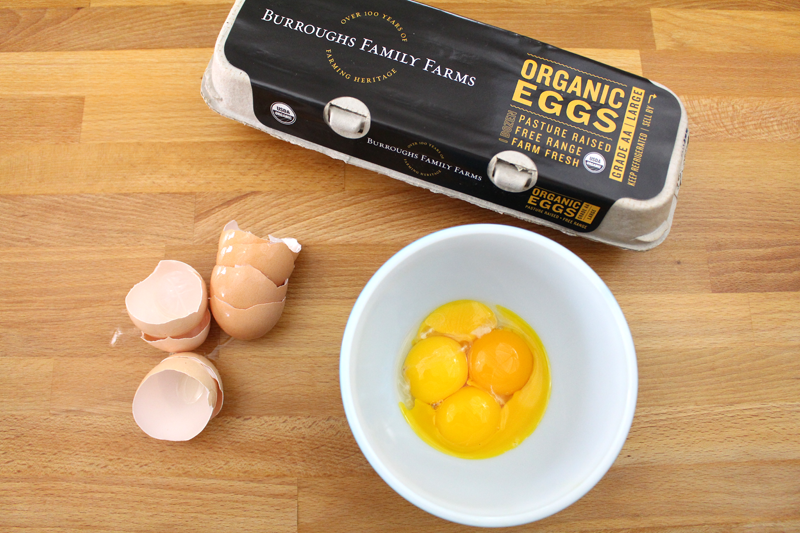 I love Burroughs Family Farms’ eggs, so that’s what I used today. 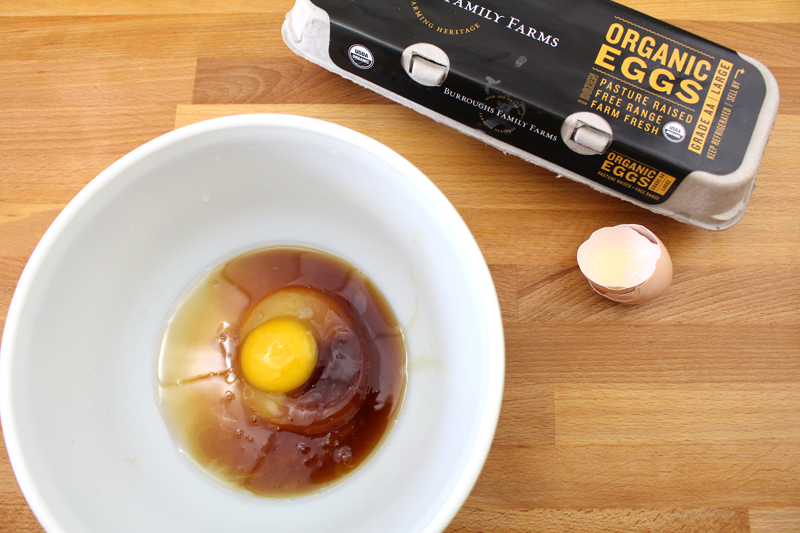 The yolks are always the most brilliant golden yellow. I just can’t get enough! I’m pretty picky about what I eat when it comes to sugar. I’m ok with the occasional treat, but in general, I avoid refined white sugar like the plague. Instead I like to use honey and maple syrup. 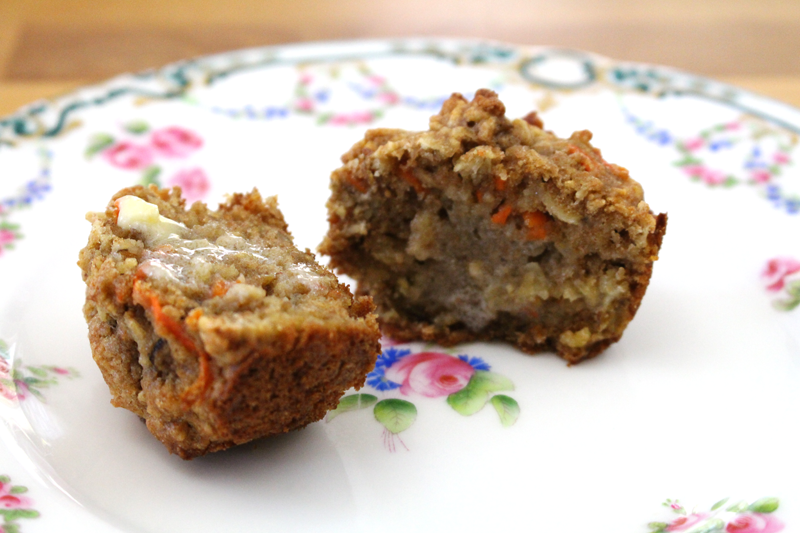 Combine that with the oats, whole wheat flour, vegetable, and fruit that these muffins contain, and I feel great about them for breakfast, lunch, or a satisfying snack. I was totally going to add chocolate chips. I even had them out on the counter. Then I forgot. Add ’em if you’d like. You could also add nuts. I’m not crazy about them in baked goods. But, to bump up the protein, or just because you like them, you could add some almonds or walnuts either to the batter, or gently press them into the top before baking. I enjoyed these with some homemade butter. They’d been cooling for a little while when I finally got a taste, but were still warm enough to melt the butter just slightly. But even without butter (which is how I ate my second one), they’re absolutely delicious. Position the rack in the center of the oven and pre-heat to 350F. 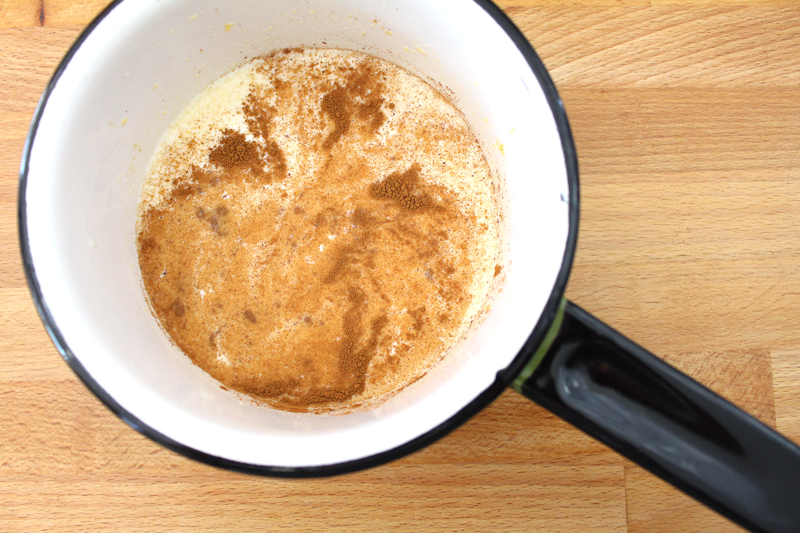 Whisk flour through ginger. 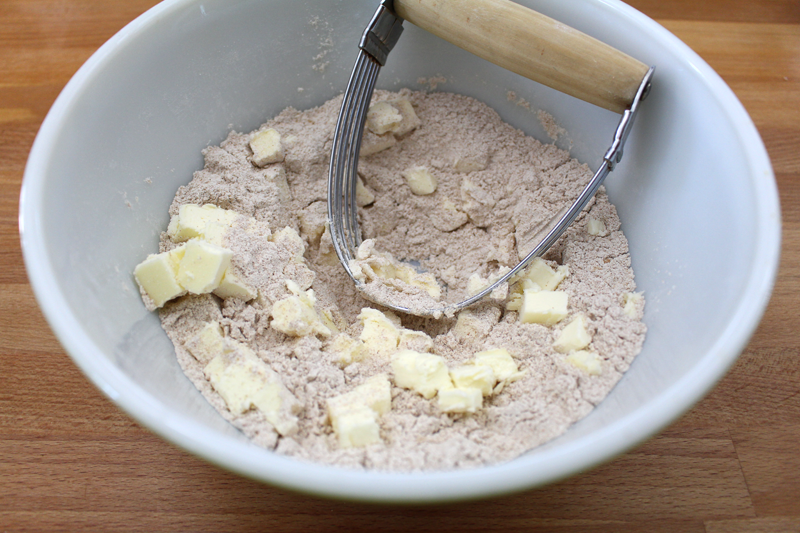 Mix in butter with a pastry blender or hands until coarse meal or small (pea sized) chunks remain. 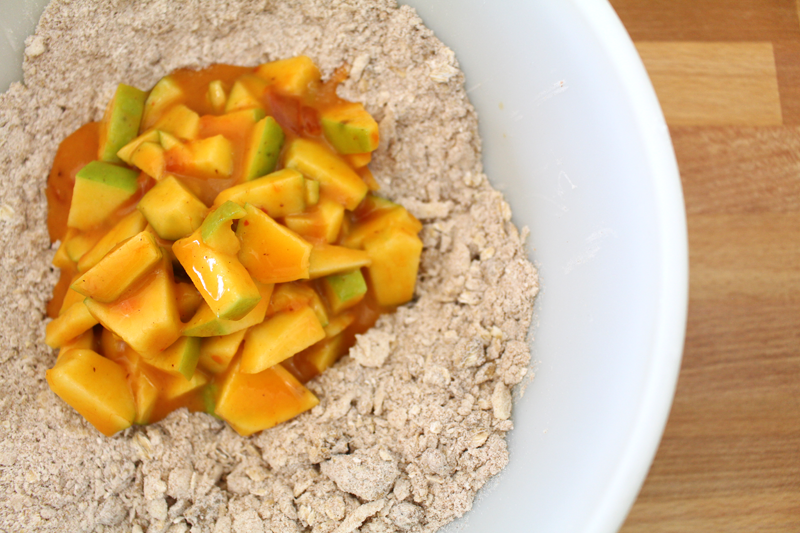 Stir in oats through fruit. Set in the freezer while you assemble the wet ingredients. 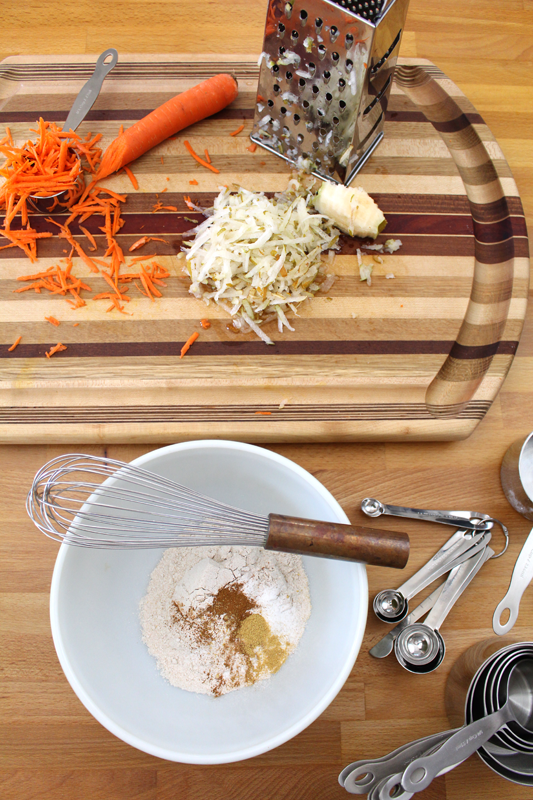 In a separate bowl whisk honey through vanilla. Add to dry ingredients and stir to combine. 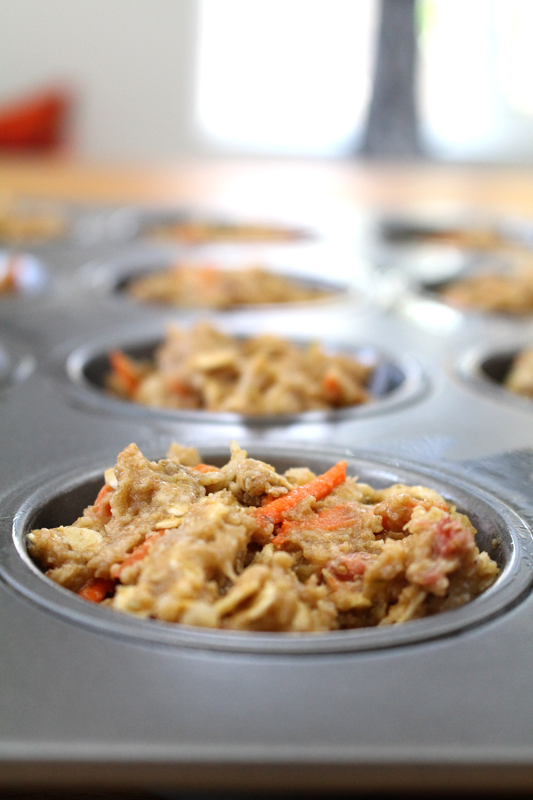 Scoop about 3T of batter into each compartment of a greased muffin pan (should yield 1 dozen). Top with nuts if desired, pressing them gently into the batter. Bake for about 20-22 minutes, or until a toothpick comes out clean and the center of the muffin springs back when touched. Remove from the oven and cool for about 5 minutes in the pan. Transfer to a cooling rack and cool completely. Crème brûlée is by far my favorite dessert. Ever. When we were in Paris nearly two years ago, we ate as much of it as we could. I never tired of it. I’ve made it a few times at home. Different recipes, different results. Same as when we were in Paris. Each restaurant yielded something a little bit different. Some were more of a crème anglaise (which is more of a thick creamy sauce), some more like what I consider to be a traditional crème brûlée. There’s just nothing like the subtle sweetness of the rich cream, the cracked sugar on top, the vanilla beans speckled throughout. 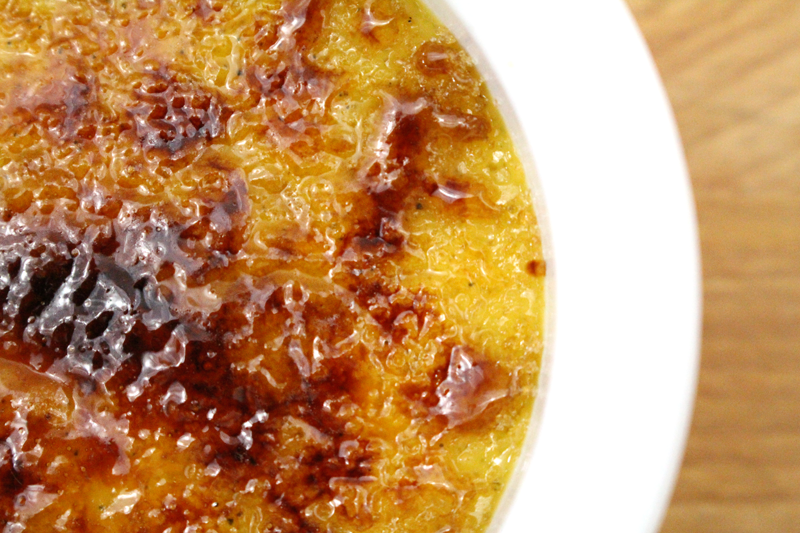 I’m not much of a sweets person… unless there’s crème brûlée. It’s a mixture of egg yolks, cream, and sugar. I separated the egg yolks from the whites (and saved them for dinner), and let them come to room temperature. That way when tempering, they will have less of a jump to warm to the temperature of the cream (more on that later). 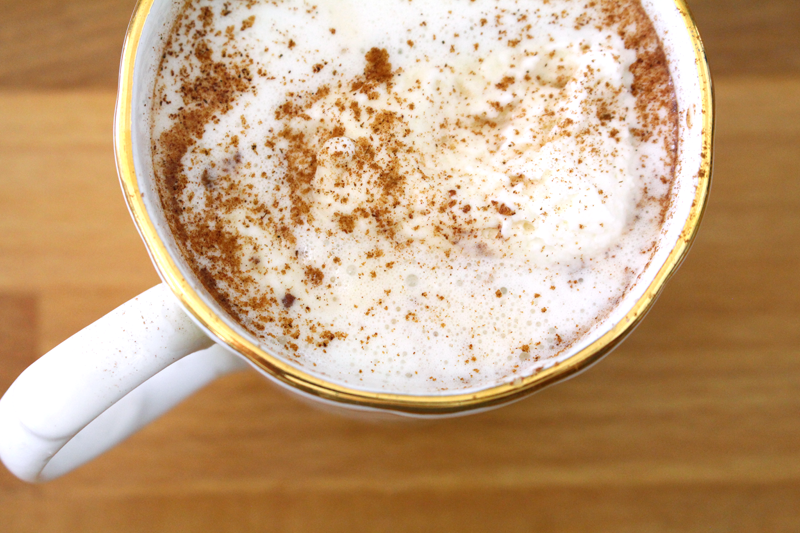 I used maple syrup and honey instead of sugar, and a mixture of cream and whole milk. And then there’s the smell of the vanilla bean. It has to be one of my favorites. 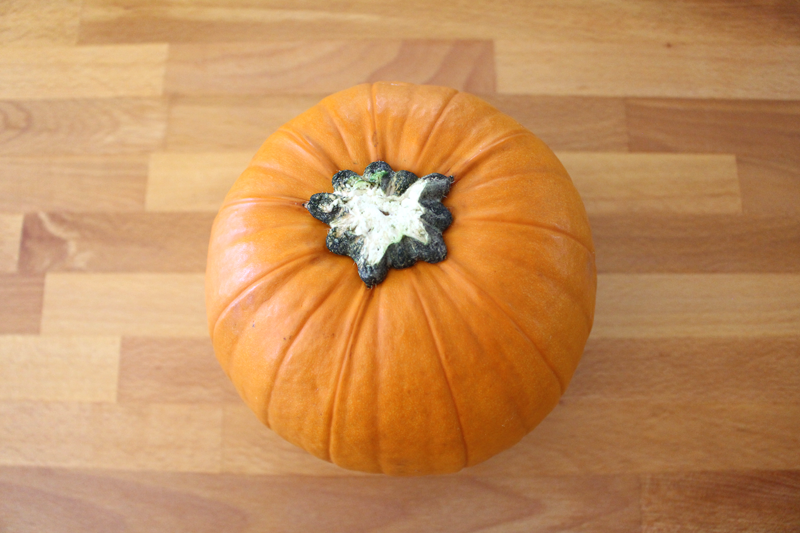 To remove the seeds from the pod, split it down the middle and scrape them out with a knife. The next few steps are a little bit, not tricky, but particular about how they’re done. 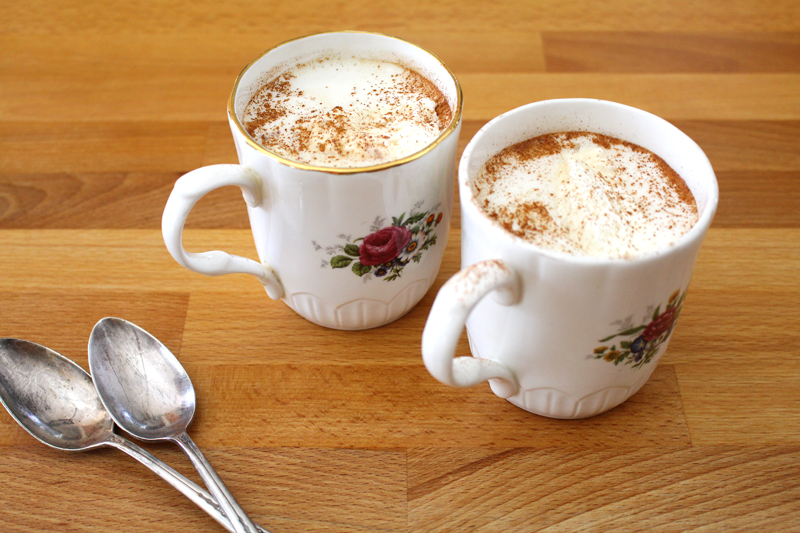 The cream, milk, vanilla, honey, maple syrup, and a pinch of salt are heated slowly in a saucepan. No boiling, just until steam rises. Not too difficult. The next part is where you can get into trouble if you’re not careful… Egg tempering. A bit of the hot liquid is introduced to the cooler eggs, to bring them closer to the temperature of the hot mixture, before they’re added to it. We do this so that the eggs don’t scramble when added to the hot cream. Scrambled egg brûlée is a lot less appealing than crème brûlée. If you do accidentally scramble them (you know, as long as it’s not all of them), you can strain the lumps out. 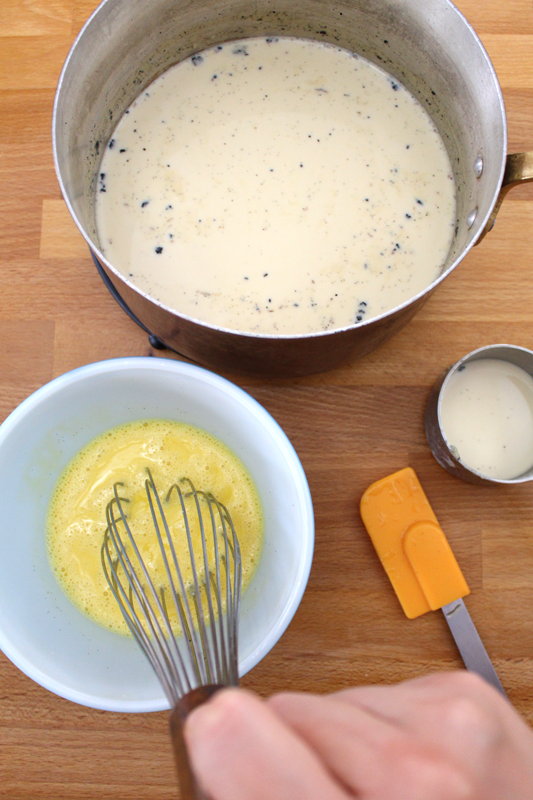 Once the eggs are warmed, they are whisked into the cream mixture. Then they all return to the stove to thicken. You don’t want to let them get too hot, because the eggs could still scramble. I like to stir constantly with a wooden spoon so I can keep an eye on things. After about 5 minutes it started to thicken, and at about 7 minutes, it was thick enough to coat the spoon without running right off. Perfect. Away from the heat it goes. At this point, you could just whisk in some melted chocolate and drink it, straight from the saucepan. I didn’t, but I considered it. You have two other options. 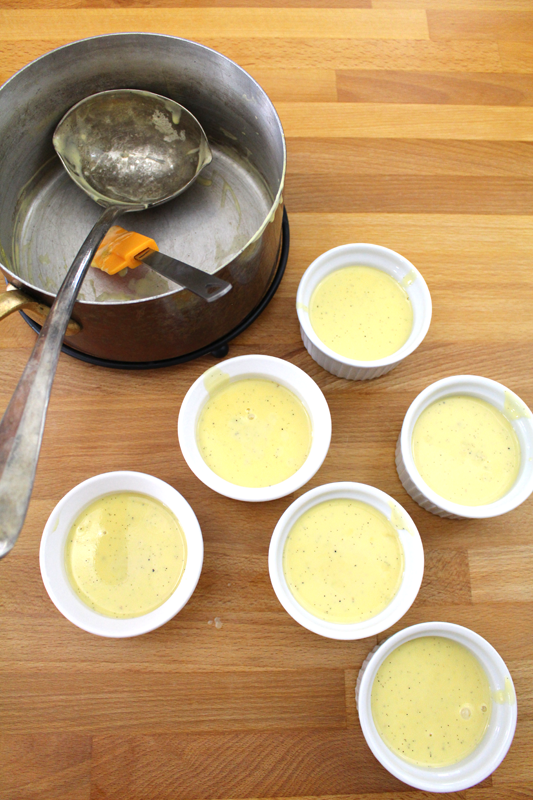 If you want to do a quicker, oven-less version, divide the custard mixture between six ramekins, then pop them into the fridge for 2-3 hours, or until thickened and set. 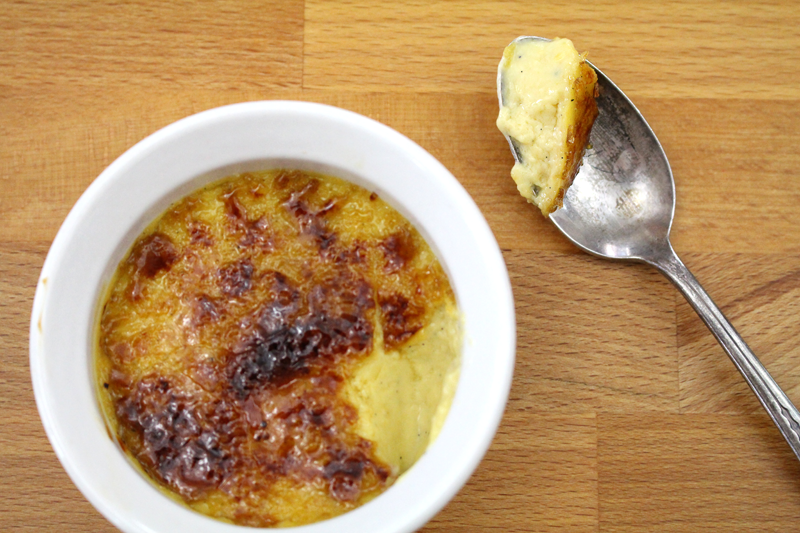 This is more of a crème anglaise, but you can still top it with sugar and brûlée it. 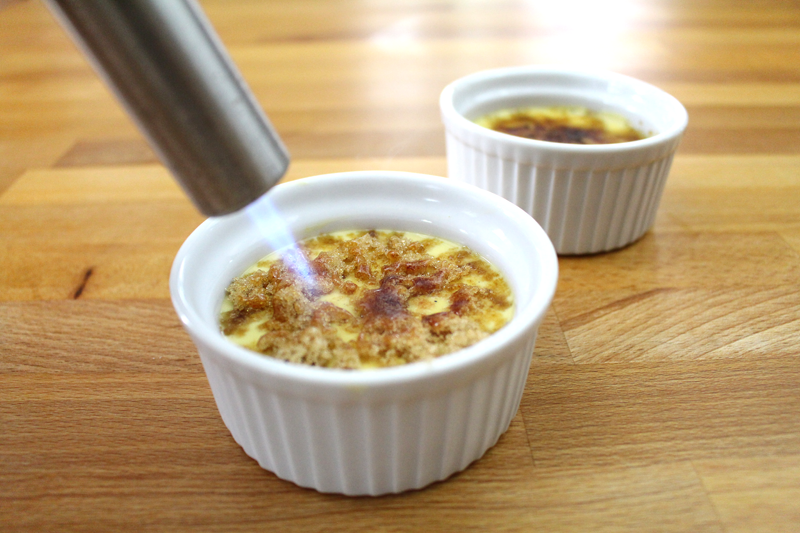 I made them both ways and they’re both delicious, but my preferred method is for a more traditional crème brûlée. This means putting the ramekins in an oven-proof dish with sides, adding some warm water, and baking until they’re just set. 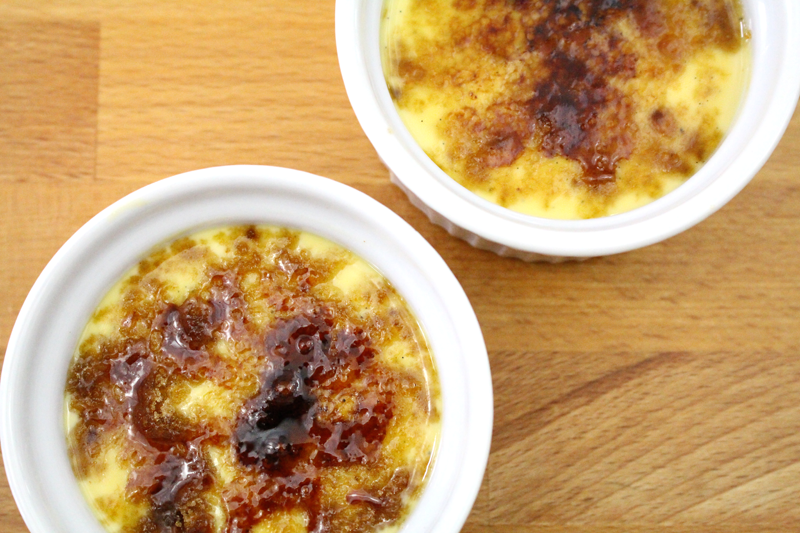 After they come out of the oven, they need to cool completely… My one frustration with crème brûlée is how long I have to wait before I get to eat it. 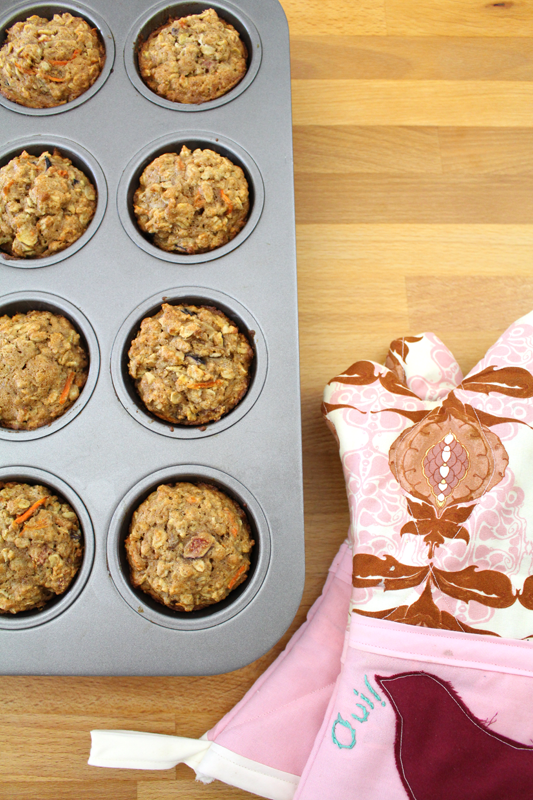 Whether they’re done in the oven or not, it’s best to give them 2-4 hours in the fridge to cool and set. I do not like this part. Whether you wait or not is up to you. I tried them at various stages of cooled doneness and they’re best really cold. But, suit yourself. Sprinkle with some brown sugar and torch ’em! If you don’t have a kitchen torch, you can use the broiler… But, leave the door open and watch them the whole time. They will burn quickly and you don’t want that. And now, it is time. Use the back of your spoon to tap the hard sugar and crack it. 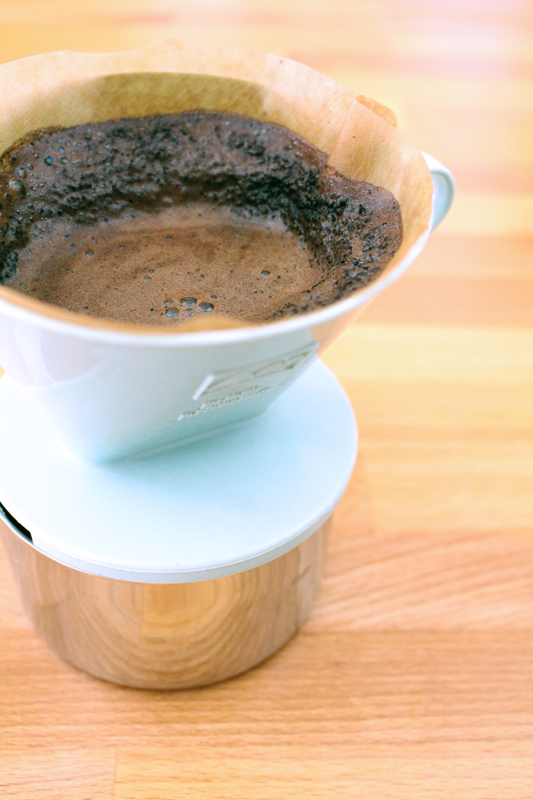 Rich, creamy, subtly hinted with vanilla. If you eat two, I won’t judge. Rub an ice cube over the bottom of a medium-sized saucepan. 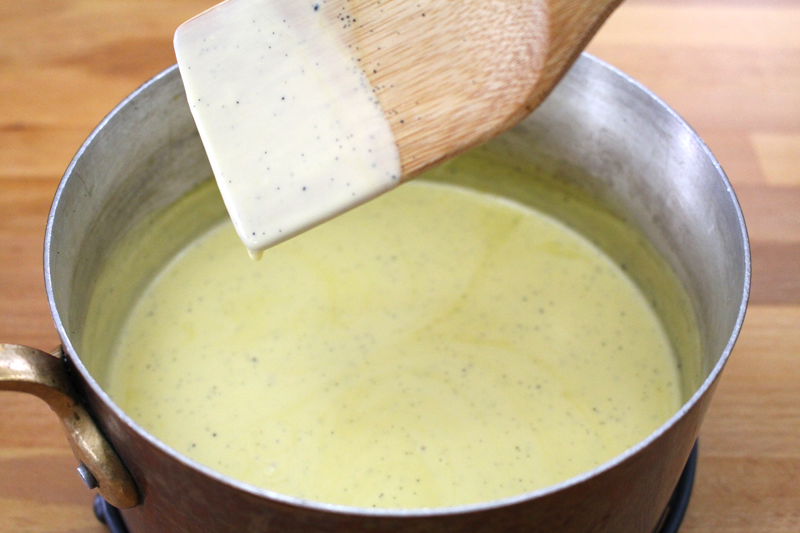 Add the cream through honey and heat over low, stirring occasionally with a wooden spoon, until steaming (about 12 minutes) (do not boil). Remove from heat. 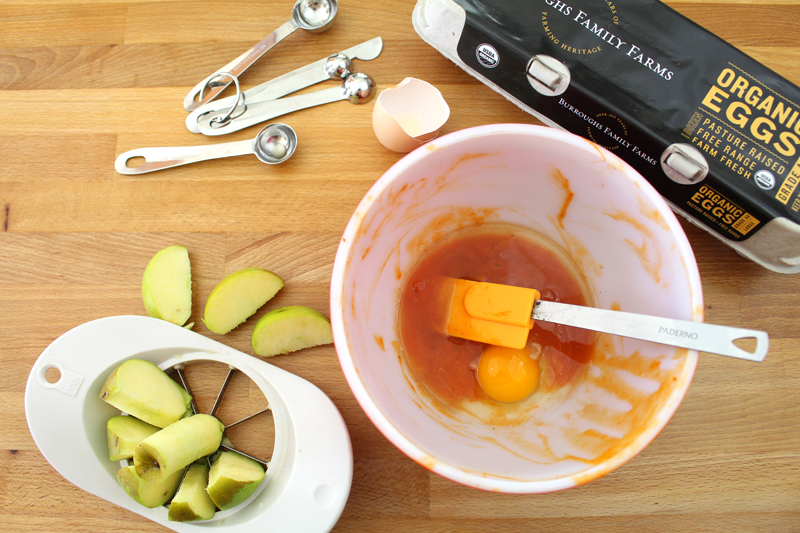 Whisk eggs in a medium-sized bowl. As you whisk, slowly add about 1/2 C of the hot cream mixture. Add a bit more, until eggs are warm. Then add the egg mixture to the cream mixture. Whisk for 2 minutes off the heat. Return to the stove and cook over low heat, stirring constantly with a wooden spoon, about 6-7 minutes, or until the mixture has thickened slightly, enough to coat the back of a spoon without running right off. 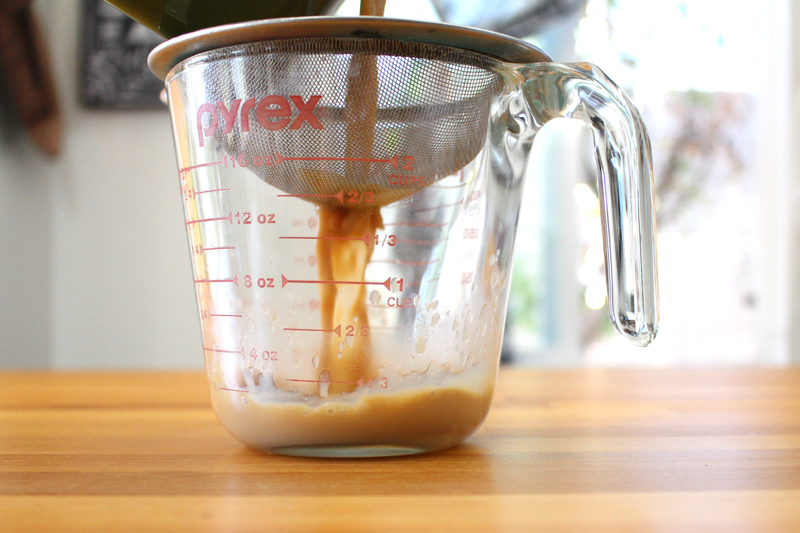 Pour the mixture into 6-3 inch ramekins (fill to about 1" deep). Set in a baking dish and pour warm water about halfway up the outside of the ramekins. Bake at 350F for 25-35 minutes, or until they're just set. Remove from water immediately and cool completely (cool to room temp and then refrigerate for 2-4 hours) before topping with brown sugar and brûléeing. 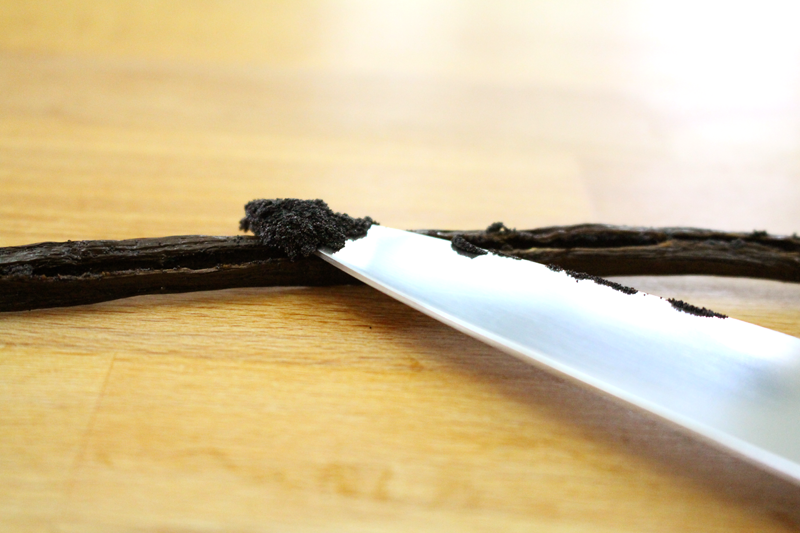 *To remove the vanilla seeds from the pod, split it lengthwise down the middle and scrape them out with a knife.